The Japan AFL Top League will this year kick off with seven sides, with the Nagoya Redbacks joining the current member clubs from Osaka and Tokyo. The season will feature seven home and away rounds, with teams playing all other sides once. The first round will see Australian-based club the Tokyo Goannas travel to Nagoya on Saturday April 25th. 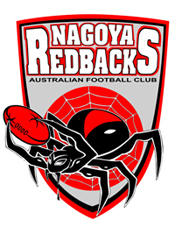 The Redbacks were undefeated at home in their career in the Nippon AFL, as well as in the recent challenge series against the Osaka Dingoes, and will be keen to keep their perfect record intact. Back in Tokyo, university clubs Komazawa Magpies and the Tokyo Leopards host the visiting Osaka Dingoes and university graduates Eastern Hawks respectively. The seventh club in the Top League are the Senshu University Powers, who have the bye in round one. Also on the schedule for this season is the annual international Narita Cup, a possible Goannas vs Japan All Stars match in July, and a road trip to Kuala Lumpur, Malaysia for the Asian Championships in early September. The season will wrap up in November, with semi-finals to be held on November 8th and the Grand Final on November 22nd.